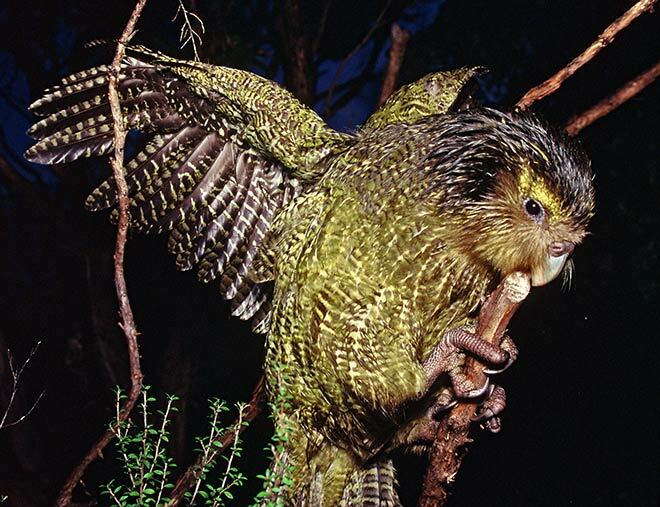 Kākāpō are nocturnal, flightless parrots that are unlike any other parrot. At night they jog for kilometres along the ground and clamber round in trees, searching for food. They use their short wings only for balance, or like a parachute to break their fall. Fine whiskery feathers around the face and a good sense of smell help them sense their immediate surroundings in the dark. Their soft plumage gives them better insulation than most birds, and this, combined with a lower body temperature, means they use less energy.